The ability of pressure to change inter-atomic distances strongly leads to a wide range of pressure-induced phenomena at high pressures: for example metallisation, amorphisation, superconductivity and polymerisation. 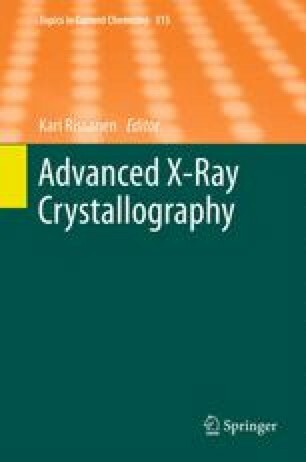 Key to understanding these phenomena is the determination of the crystal structure using x-ray or neutron diffraction. The tools necessary to compress matter above 1 million atmospheres (1 Megabar or 100 GPa) were established by the mid 1970s, but it is only since the early 1990s that we have been able to determine the detailed crystal structures of materials at such pressures. In this chapter I briefly review the history of high-pressure crystallography, and describe the techniques used to obtain and study materials at high pressure. Recent crystallographic studies of elements are then used to illustrate what is now possible using modern detectors and synchrotron sources. Finally, I speculate as to what crystallographic studies might become possible over the next decade. I would like to thank and acknowledge the numerous colleagues and collaborators who have contributed to the research and developments published by our group over the past 20 years that I have cited in this review. I would also like to thank facility staff at synchrotron and neutron sources for their assistance and support in the experiments and technical developments. This work was supported by grants from the Engineering and Physical Sciences Research Council and the Royal Society, and facilities and funding provided by SRS Daresbury Laboratory, ISIS, the European Synchrotron Radiation Facility, the Advanced Photon Source, the Institut Laue-Langevin, and Diamond Light Source.